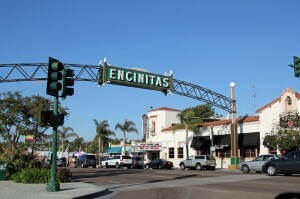 Located 25 miles north of downtown San Diego, and with a population of close to 60,000 residents, the city of Encinitas is a quintessential Southern California beach community known for great surfing, the commercial growing of ornamental flowers, and a relaxed and family-friendly atmosphere. The town has something for everyone: from restaurants, galleries, shopping centers and small eclectic shops, to golf courses and equestrian facilities. There’s residential real estate for just about everyone as well: from affordable and luxury condominiums, to multi-million-dollar homes and vacation homes overlooking the Pacific and its beautiful beaches.